Drivers are also excited about the nationwide exposure that this award will have. “It’s really cool that Speed 51 is doing this and that PASS is getting recognized nationwide,” said Johnny Clark. Handicapping the field will not be easy. Voting will start around June 1st and fans can vote once per day. To be deemed eligible, a driver is only allowed to miss one race during the 2005 season. Drivers will also be allowed to vote as long as they stick to the one vote per day rule. Some competitors are already planning a race strategy. “I have an office job [selling trailers], so I’ll probably get on there a few times to vote,” said Cassius Clark. The winner of the award will receive a web design from 51 Sports (parent company of Speed51.com) with an estimated value of $4,500. recognizable and successful tours in the country. The racing is tight and close and fans are made instantly by anyone who sees one of their events. Long time New England short track fans have also grown to love the series. It’s going to be a battle that pits buddy against buddy, father against son and racer against racer; it’s the Speed51.com Most Popular Driver competition – PASS Pro Stock (Super Late Model) style. The deep Northeastern-based tour has a very diverse group of full-time racers. 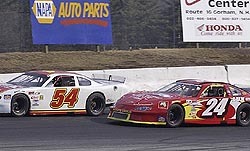 The PASS cast of characters include one of the most successful father and son combinations in all of short track racing – Mike Rowe and his son Ben, close friends like the unrelated racers that share a last name – Johnny and Cassius Clark, the quiet and quick trio of Richie Dearborn, Corey Williams and Donnie Whitten, young rookie Michael Ruttkamp, Southern New England veterans Rick Martin and GeGe Gravel and colorful personality Scott Mulkern. The program was announced to competitors in the driver’s meeting for the PASS season opener at White Mountain Motorsports Park (NH) and the response was very positive. Scott Mulkern (#84) and Cassius Clark (#8).